This device is part of the LeapFrog Pollux Platform, it's recommended to start there for general information. The LeapPad1 is part of 3 different devices that all share a common hardware platform, based around the Pollux SoC. The platform page contains information generic across these devices, and it is recommended that you refer to that page as it is a good starting point to understanding the LeapPad1, and contains some basic How To's and Tutorials to get you started. 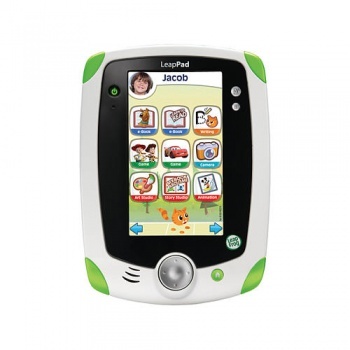 The LeapPad1 (like the Didj and Leapster Explorer) is a toy produced by Leapfrog marketed as an educational handheld gaming console for kids aged 4-9. Although it has a proprietary graphical front end, it runs a generic Linux distribution on the same ARM9-based processor as the Didj and Explorer. It also has built in accellerometer, camera, and microphone, along with a bigger touch screen. There are also hints of an internal rumble pack of some kind in the latest source code. Scan of front side of LeapPad1 mainboard. Scan of back side of LeapPad1 mainboard. With CPU and cartridge socket desoldered - scan of back side of LeapPad1 mainboard. This page was last edited on 15 February 2013, at 01:11.